Robert Paul Jackson, “Bob,” entered into the hands of his Lord and Savior, Jesus Christ, on September 3 2018. Bob was born on December 9, 1943 in Baltimore, Md., the son of the late Edmond Carroll Jackson and Delcie Dotson Jackson. 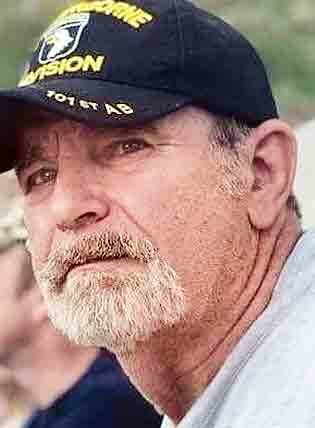 Bob was an Army Veteran of the Vietnam era and served in the 101st Airborne Division as a paratrooper. He was awarded several medals during his multiple tours of duty. Bob was well known as the owner and operator of a Century 21 franchise in Harrisville, WV for many years, and later owner and operator of Venture Petroleum, an oil and gas enterprise. Bob also served as County Commissioner for Ritchie County for several years. Most importantly, Bob was a Christian and a member of the Pennsboro Church of Christ where Terry Jones served as pastor and also attended Pike Church of Christ where his brother Norman serves as song leader and Jamie Matheny serves as Pastor. Bob also considered himself for many years a faithful member of the televised Christian Church, Shepherd’s Chapel with Pastor Arnold Murray. Two of Bob’s greatest side pleasures were golfing and presiding over the Stewarts Run Hunting Club which included members, Junior Jameson, Dr. Steven Zekan, David Zekan, John Zekan, Dr. Tom Zekan, “Bill”Stewart former football coach of WVU, Ted Stewart and his son Blaine and other family and friends. Bob is survived by his children, Joseph Michael Jackson, and Jessica Lynn McComas and husband, Edward and their two children, Edward McComas III and McKenzie McComas of Harrisville. Bob is also survived by twin sister Judy Basile-Clark of Charleston, with whom he had a very special relationship throughout the years, as twins often have, her son Joseph C Basile III of Florida, and grandson Joshua Lacy Canterbury and his wife Sara Canterbury; brother Norman Jackson, a well known business man in Ritchie County, and children, Mark Jackson and wife Andrea and their children Mercedes Egan and husband Joshua Egan, a Ritchie County police officer, Ben Jackson and his wife, Cailin Jackson, Rebecca Goff and husband Billy Goff and their children Cody, Tucker and wife Lexie, Olivia, and Emily Goff, and Steve Jackson and children Reno and Regan Jackson; Sister Sandra Hammond of Georgia and former teacher in Ritchie County Schools and daughter Kelli Grogan and husband Scott and their two adopted children, Nate and Serena Grogan, and son Zack Grogan; Sister Barbara Lopez and husband Dave Lopez, a retired businessman of California and their children, Jason Lopez and wife Alysia Lopez of California and Monique Charron and husband Sheldon Charron of California and numerous friends and other relatives. Bob is also survived by his loving sister-in-law, Sharon Jackson and her children Timothy Jackson and his children Andy and Jason Jackson and Melissa Flanigan and husband John and their children Heather and Austin Flanigan. Bob was preceded in death by his parents Edmond Carroll Jackson and Delcie Dotson Jackson; Brothers-in-law, Junior Jameson, Dr. Joseph C Basile II, Larry Sem Clark; Sister-in-law, Gladys Jackson, wife of Norman Jackson; brother Lehman Brooks Jackson on August 14, 2018, husband of Sharon Jackson; Niece Julie Basile Canterbury, daughter of Judy Basile Clark. The gracious open custom for funeral services and visitation will be Saturday, September 8, 2018, from 4 – 8 pm for visitation at Raiguel Funeral Home in Harrisville. The Funeral services will be conducted at Raiguel Funeral Home on Sunday, September 9, 2018 at 2 pm.